I have to admit that I have deep feelings of gratitude towards one vegetable – the fennel. Today I decided to introduce it to you in a glamorous role – that of a key ingredient in a salad. In a moment very special and important for me, I added it to one of my fish recipes. And, I was admitted to the finals of the cooking show ‘Master Chef’. In my home country we call it wild dill. It has a deep anise aroma and that is why one either likes it a lot or can’t stand neither its taste, nor its aroma. This is why I like it – because it has a character, there’s no middle point with it! Just like me.. If you decide to try out the fennel raw, you will find out it has a very specific aroma. But, if you prefer it softer and with a lighter taste and aroma – cook it. With this root you may cook thousands of dishes – salads, soups, side dishes, main dishes…it’s a really long list. In Italy this delicious root is used as an ingredient for salami, in UK it’s a must when you cook dish. Its seeds are usually added to a number of bread products, but it also plays an important role in the preparation of some types of liquor. As far as the nutrients in the fennel are concerned, I know that it contains a lot of essential oils which alleviate stomach ache. It also contains few calories and so is being frequently part of healthy food regimes. Start by cutting the fennel root in half. Then, cut each half into 3 pieces. Put baking paper in a pan, lay out the fennel pieces in it, sprinkle them with cumin, mint, a little olive oil and grated Parmesan cheese. Set the oven to 170-180 degrees and bake the fennel for approx 15 minutes (or until it’s ready). Don’t overcook the fennel – it will become too soft and not that delicious. 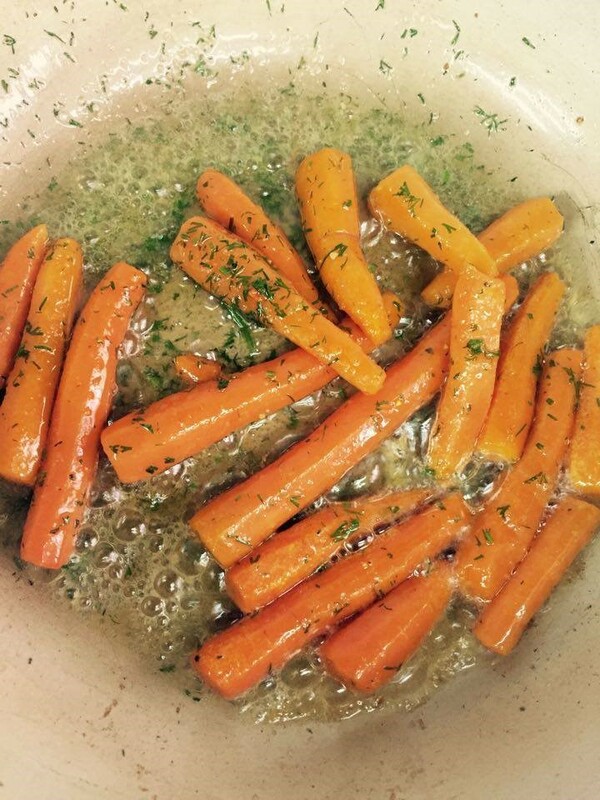 Meanwhile take care of the carrots – glaze them in a frying pan with some butter, olive oil, salt and a bit of sugar. Before removing from the stove, sprinkle with fresh dill. Let them cool out a bit. 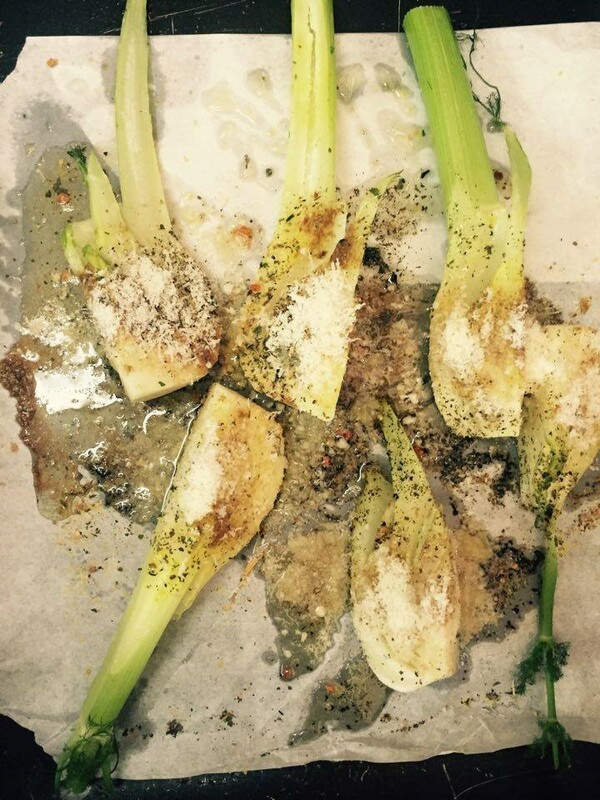 Check out if the fennel is ready and if it is, let it cool off a bit. 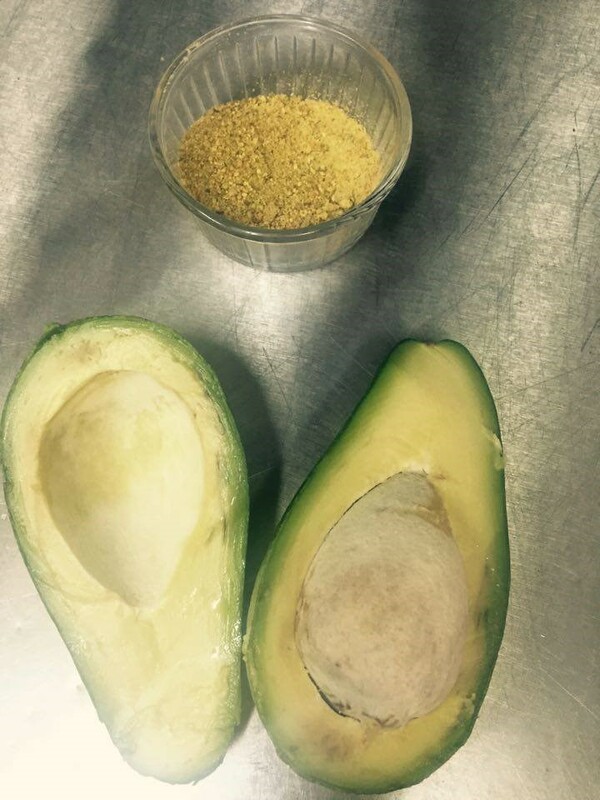 Cut half avocado in a few parts and sprinkle with lemon juice so it doesn’t change its color until it’s time to serve the dish. 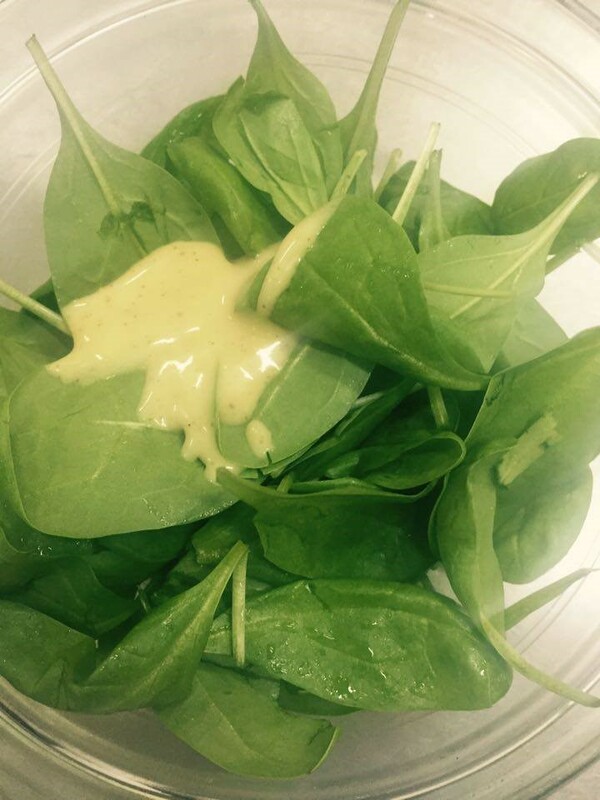 Put the spinach leaves in a bowl and add the honey-mustard dressing on top. Mix with quick movements, without putting pressure on the leaves. 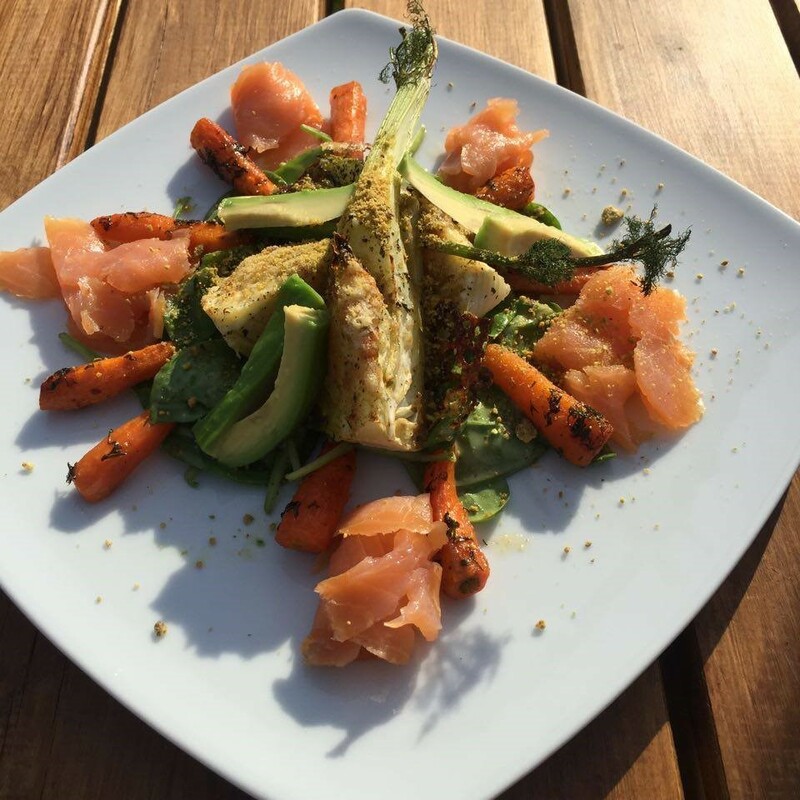 This dressing is very easy to make – mix honey, mustard, olive oil and lemon juice. Or, use a ready dressing, you can find high-quality dressings of this type in shops. Use as a basis the spinach leaves which we mixed with the dressing sauce. 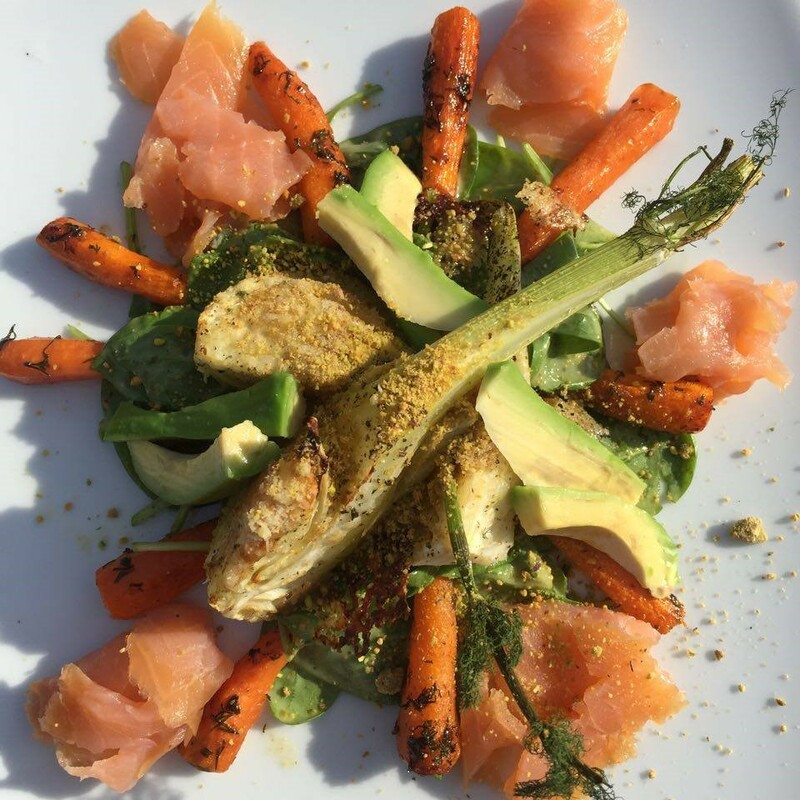 On top add the fennel, carrots, avocado and salmon. Sprinkle with finely ground pistachio. What you just got is a very healthy, delicious and beautiful salad, which I consider a main dish.